Your CV is your chance to sell yourself to a prospective employer. This is not something that should be rushed, nor should it be an autobiography that tells the reader your whole life story to date. It should be a clear, concise overview of your career so far and should tell the hiring manager why they should interview you over the rest of the candidates who applied. The job boards these days make it very easy for job seekers to press the apply button and for your existing details to get sent through to the recruiter. This means that unless you physically check and upload and update your new details, the CV I am likely to receive is going to be the CV and profile you used last time you were looking. Fact – 1 in 5 CVs are out of date, often with incorrect contact details as well as an out of date career history. People that are serious about getting a new job don’t leave things like this to chance. Lunch time job seekers that are “always on the lookout” do. Always put your correct contact details on you CV – how else is anyone going to get in contact with you?! Your aim is to get the hiring manager/recruiter to call you – make it easy for them! In many roles, particularly field sales, my speciality, location is key! Make sure yours is on your CV! At least three people I call every day have an out of date CV and what’s worse, the candidate hasn’t even realised! Don’t let that be you...take the time to check! How many jobs are you not being considered for without even realising it for this reason? Start with your most recent job and go from there. And explain gaps in your employment...if you’ve taken time out to have kids or look after relatives, or even travel the world, then say so! Be as precise as you can with your employment dates – month and year are much more helpful than an approximate year that you started. Also, don’t lie...you will get found out eventually. This has happened to more than one candidate that I know of. They have lied on their CV about their employment dates and have been found out at job offer stage, only to have the offer withdrawn. Be honest. Present your CV well – there is no excuse for poor spelling and grammar and this is a real turn off for recruiters when screening and shortlisting. If this is how you present yourself on a CV, what is your written communication like to your clients? If this isn’t your strong point, find a friend who can check it for you – don’t rely on the computer spell checker! Don’t forget the little things either, like make your name bigger than the rest of the text so it stands out, and use a font that is easy to read. Remember, this is your future employer’s first impression of you, it needs to be a good one! Good recruiters will gladly offer free advice and feedback on your CV. Just like we do for sales professionals that we are representing. Don’t forget your achievements. 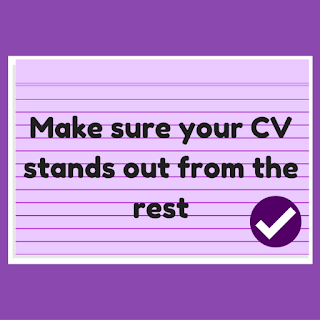 Every CV should have key achievements on – remember your aim is to get not just a call but an interview – make sure you give yourself the best chance! If you work in sales, include your sales figures and achievements for each role. If you’ve won awards or been top of league tables, include these achievements too – that’s what recruiters and hiring managers want to see! As I said, this is your chance to get your CV in front of a hiring manager. You want your CV to present your career so far without it becoming a novel on your life story so far! 2 to 2.5 pages should be enough to get the main points across and sell yourself. Remember, you’re aiming to get an interview, where you can go into a lot more detail. Make sure your CV contains key words about what you’re looking for and what skills you have to bring – recruiters/employers will be searching for people using keywords for specific roles and skills...make sure your CV comes up first. Finally, if you’ve sent your CV off to a recruiter or hiring manager, don’t be afraid to ask for feedback. Give them a call and ask what the likelihood is of you being shortlisted. And if you didn’t get shortlisted, find out why. This will help you refine your search or application accordingly – see my previous blog on “why it is important to always give feedback” for more on this. Follow these tips and you should find writing your CV is a much less daunting experience...and it should mean your phone starts ringing with those all important job opportunities! Good luck! I can always find food for thought in your blog. Reading your articles is my pleasure. Sometimes I need to write my paper online including a resume. Your tips will help me create a good resume. Thank you!